You never know when you are going to need a little extra traction to keep your vehicle on the road. You never know when things might get a little slick and you might long for a vehicle with good traction. 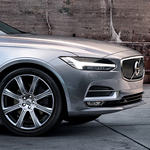 The Volvo V90 is set up with a standard all-wheel drive feature to provide you with the traction that you need. It is nice to be able to pick a drive mode for each driving experience that you have. When you head out in the Volvo V90, you can pick the drive mode for this vehicle that makes the most sense for the specific journey that you are taking.